When the movie “Argo,” which is up for a “Best Picture” Oscar, opened in area theaters, friends said we just HAD to see it. In truth, we never hid in the Canadian Embassy in Iran like the six Americans in “Argo” did. And we weren’t at the U.S. Embassy in Tehran when Iranian rebels stormed it and took hostages in late 1979. But we did survive some uncertain and even heart-stopping moments leading up to and including our exit from Iran earlier that year as the Islamic Revolution swept the country. That conflict sent Iran’s ruler, Shah Reza Pahlavi, into exile and thrust the Ayatollah Khomeini and his Islamic theocracy into power. As a U.S. Air Force officer, my husband received orders in 1978 to serve as an advisor to the Iranian Imperial Air Force. Since the assignment was a two-year accompanied tour in Iran, our three children, ages 2, 10 and 13, and I could go, too. We were excited. What an adventure! Another country. A different culture. Exotic cuisine. From the outset we were struck by contrasts caused by 20th Century progress elbowing its way into the country’s ancient civilization. Chadore-cloaked women navigated streets lined with modern high-rises and giant cranes perched near more under construction. Blood drained from slaughtered sheep into ditches as gleaming new Mercedes flashed by. We were in for an interesting time, never mind the extraordinary security measures American military troops had to take. Some of those included wearing civilian sports shirts over their uniforms to hide their rank; not carrying brief cases, which were a mark of importance, in public; riding buses with armed guards from north Tehran where they lived to the Iranian base in south Tehran where they worked, and having wives and children answer the door and accompany them on errands around the city. We had access to many facets of American lifestyle in the north of the city, thanks to Tehran American School which in truth was an international school given the great diversity of its students and faculty, and a U.S. Navy compound that included military stores and clubs, a ball diamond and tennis courts. But we were constantly reminded to “keep a low profile” so our presence wouldn’t be such an irritant to those Iranians who didn’t want Americans there and who opposed the “Westernization” of their country. Soon after classes started at Tehran American School, where I worked as a media center aide, Iranian army guards carrying M16s began patrolling the playgrounds and parking lot and riding the school buses. Police presence increased in the city and military tanks rumbled through downtown streets. As demonstrations against the Shah and arson fires escalated, martial law with a 9 p.m.-to-5 a.m. curfew was imposed. Foreign nationals, including many Americans, started pulling their children out of school and preparing to leave the country. Our Iranian landlord, whose family lived in the building where we rented an apartment, insisted that having SAVAK, Iran’s version of the Soviet KGB, as a neighbor, we were not in danger. My husband’s commanding officers gave similar assurances. In October of 1978 after a group of Iranians threw rocks at several work buses, they took more circuitous routes that extended travel time by nearly an hour. As power outages, telephone- and mail-service disruptions, and school closures grew, we fed on a junk-food diet of rumors and began to think our wonderful adventure was taking a grotesque twist. Although we weren’t afraid, we were unsettled by reports of accelerating riots and a southern sky black with smoke many evenings. Our resolve to remain calm and optimistic was shaken when some Americans found notes on their cars and in their doorways saying, “Go home domed Yonkeys or you all die.” We were further unnerved when two U.S. government employees’ cars were firebombed just four blocks from our home. Except when we were at work and school and our youngest child was with the Air Force wife who cared for him during the day, we were inseparable. We had “clothes-folding” parties, did the dishes together, and huddled around our battery-powered radio trying to tune in Voice of America, but more often picking up Radio Moscow. Some of the precautions we took might have been considered paranoid in other circumstances. We didn’t wash the car so it would look less American. We taped over the U.S. military identifier on the license plates. We peeked out of drawn drapes or crept up to the roof to investigate sudden noises. By Christmas, our isolation was pretty complete. We managed to celebrate, though, and even had gifts for each other. The celebration ended on New Year’s Eve when we learned that the children and I had two days to prepare to evacuate. My husband’s fate was left hanging. We flew out on a military cargo aircraft and after a three-day odyssey that took us through Athens, Greece; Rome, Italy, and New York City, we arrived at my parents’ home in Virginia. After regrouping, we moved back to Michigan. That’s where we had lived and my husband was stationed before being transferred to Iran. We had friends and the Air Force base there for support. Most important, though, the schools would readmit the children, even though we had no school records. Meanwhile, my husband soldiered on in Tehran, lonely in a cold, empty apartment, going to work when it was deemed safe, even though he had no work to do. Then an uprising on the base trapped the few Americans still reporting for duty there. They were rescued by helicopters that ferried them to the Navy compound in north Tehran, then left them to find a way home. On another occasion he was trapped in his apartment as rebels, swarming the neighborhood looking for Americans, shot up the building. A man the landlord had left to watch the property—after he and his family had fled to London—knew my husband was home. But he told the rebels when they pounded on the door that the American who lived there had run away. After they left, my husband, who had been hiding for four hours in the bathtub with the shower curtain drawn, found the roof littered with spent bullet shells and a hole in the window above the bathtub. He and three other Air Force officers who lived in the neighborhood barricaded themselves in one apartment and awaited orders. Finally, word came that they would be notified on a specific day to meet at the U.S. Embassy and be flown out of the country. One last close call came the day he was supposed to have gotten word to go to the Embassy, but didn’t. He luck held, though, thanks to a co-worker paying the taxi driver who had driven him to the Embassy to check my husband’s apartment to see if he needed a ride. And he did! So after the announcement that “Argo” had gotten a Best Picture nomination, my husband surprised me by suggesting that we see it. We would just and enjoy it, we agreed, and try to overlook inaccuracies or to find parallels with our experience. When the flight attendant in the movie announced that the airplane that was whisking the six Americans out Tehran had cleared Iranian airspace, I wondered what my husband was thinking and feeling. It was definitely an emotional rush he said when I asked him as the end credits rolled. With the Badgers facing Stanford in the 2013 Rose Bowl, many Wisconsinites will tune into the game that evening with avid interest. I will, too. But for more sentimental reasons than most. My daughter met her future husband thanks to Wisconsin playing in a Rose Bowl game. The year was 1994. She was a UCLA grad student and he was Badger fan attending from Milwaukee. Their union and the 2001 birth of the first of their three children led to my husband and me moving from Southern California to South Milwaukee in 2002. But I also have a special connection with the Tournament of Roses Parade that will air earlier on New Year’s Day. Five years before the Wisconsin-UCLA contest (Wisconsin won, by the way), I was behind the wheel of a Rose Parade float proceeding along Pasadena’s Colorado Boulevard. The thought, much less the possibility, that I would ever drive a Rose Parade float had never occurred to me. It did, however, occur to Greg Jenkins and Thom Neighbors. At least it occurred to them to have someone at the Pasadena Star News where I was city editor drive their float and write about it. Their idea was to get publicity for their small start-up float-building business, Bravo! Productions. Greg’s call to the Star News, which was routed to me, was a bit coincidental. The newspaper’s managing editor, Terry Greenberg, had been wondering if one of our reporters could ride on a float and write about the experience. But drive a float? My heart leapt. “You have anyone in mind?” Greenberg asked when I told him about the call. “Who?” he wanted to know. Knowing my lead-foot reputation, he reluctantly agreed – as long as I promised not to try to lap other floats in the parade. The precious cargo on my float, themed “Music of the Caribbean,” was to be Miss Puerto Rico and her royal court. Yes, I would drive very carefully! Being a float driver, I learned, involved more than just showing up on New Year’s morning. Duties included taking part in vehicle mechanical checks, meeting with Tournament of Roses officials, taking the float on test drives at various stages of construction, ferrying the nearly completed float from its Azusa construction site 20 miles east of Pasadena to a site near the Rose Bowl – and starting an intensive left thigh-strengthening regimen. That was because the clutch was so heavy, I almost couldn’t operate it and the frequent stops and starts and maintaining the right pace and spacing required a lot of clutch action. The man who would have driven the Bravo! float if I hadn’t bumped him was a bit bummed and, I think, secretly hoped I couldn’t cut it. Instead he became my “observer.” Observer? Although I knew that most float drivers were concealed somehow, generally within the bowels of the flowered behemoths, I didn’t know they couldn’t see where they were going. The reason is, they sit beneath the middle or back part of the float in a kind of go-cart apparatus with a long drive shaft between the steering wheel and the front axle. The observer peers out of a small slit or portal in the front of the float. My observer and I were connected by walkie-talkie and headsets. He was there from the beginning, even before the float chassis was enclosed to make sure I could hear and understand his directions and so I could practice the time delay needed from when he gave an instruction to when I should react. “Music of the Caribbean” was the perfect float for a novice driver. It was short – only 35 feet long, compared to the maximum 55 allowed – had minimal animation – only two giant seahorses riding shotgun on either side of the float moved – and had little overhang beyond the wheel base, which would diminish chances of hooking a tuba player or cavorting clown. The test drives helped, too. The first, with all right turns, was before the driver’s compartment was enclosed and allowed a good line of vision. The second one, with all left turns, was after material called “cocooning” had been applied, rendering me essentially blind. My biggest worry, aside from plowing into something, was that my still rough clutch-to-gas-pedal coordination would flip the Miss Puerto Rico stand-in off the back of the float as we lurched forward. The final test was the night we drove from the construction site to Pasadena several days before the parade. The 48-degree temperature (quite cold by Southern California standards) gave a hint of what awaited me on New Year’s Eve. Float drivers had to arrive by 4 p.m. and be prepared to spend the night with their floats. One reason was to guard against party revelers and souvenir-seekers who, carrying glasses of wine, crowd the formation-area streets near Colorado Boulevard where floats are ferried to just before midnight. I brought a thermos of coffee, flashlight, layers of clothes and a sleeping bag. Despite that, I froze and got little sleep. At 4 a.m., we maneuvered our floats closer to the parade route where we would execute an amazing merger with bands, equestrian units and other entries for the 8:10 step-out time. When my turn came, nearly an hour after the parade started, I had shed several layers of clothing. Worse than the suffocating heat from the go-cart engine was the fumes, And, despite weeks of additional pumping iron at the gym, my left leg quivered with fatigue. As I struggled to follow the pink parade line painted down the middle of Colorado Boulevard, which I could see thanks to no floorboards beneath my feet, I fought drowsiness and questioned the wisdom of having drivers serve as float sentinels the night before. During a couple of pauses in the parade, I shed more clothes until I was down to tank top and sweat pants. When we pulled into Victory Park at the parade’s end 5-1/2 miles later, I was exhausted, starving, soaked with sweat and glad it was over. Although Bravo! partner Greg Jenkins asked me if I would want to drive again the next year, I’ve opted to just watch ever since. That will be especially fun this year with the Badgers Marching Band in the parade lineup and being able to tell my three grandchildren about the good old days when I had one of the longest, hardest, dirtiest, coldest, hottest, and most interesting, exhilarating and memorable jobs anyone could imagine. Rodney King came into my life twice. Actually, three times, if you count the Los Angeles riots. The first was on a Monday in March of 1991, the day after he was stopped, beaten and Tased by Los Angeles police officers on the Foothill Freeway in the northeast Los Angeles suburb of Lake View Terrace. That encounter wasn’t with Rodney King in person, but via a story in the Pasadena Star-News where I worked as city editor. Why, I and the newspaper’s managing editor wanted to know, did our paper run a wire story instead of a report by our own staff? Although the incident occurred outside the Star-News coverage area, the man who was beaten, Rodney King, lived in Altadena, which we did cover. Granted, the stop and beating happened on a Sunday night when we had a skeleton crew on duty, but someone should have been monitoring the police scanner in the newsroom and heard something about it. The copyeditor speculated that it might have been while he was in the restroom. The night reporter said it might have been while he was in the lunchroom. The managing editor and I knew that cop shops were known to switch their transmissions to a different frequency when they wanted to keep something away from curious ears. Maybe that’s what happened. So our paper spent the next few days chasing a story we should have been on top of from the outset. My next encounter came nearly a year later. I had left the Star-News and was working for the Los Angeles County Courts as their media liaison. We were in a courtroom where four police officers were standing trial for beating Rodney King. King’s presence was primarily on videotape, thanks to Lake View Terrace resident George Halliday, who was standing on his apartment balcony that fateful Sunday night. He was testing his new video camera and zoomed in on a commotion on the nearby Foothill Freeway. King, however, did attend the trial in person a couple of times. King was also very much in my thoughts and he certainly dominated the news after the trial ended with the officers’ acquittals. Six days of rioting, looting, arson, assault and even murder made going to work in downtown Los Angeles dangerous, to say the least. The court administrator directed all but essential personnel to stay home. Given the need to field media calls and get information to the public about court closures in riot-affected areas around the city, essential personnel included me.With police and sheriff deputies patrolling smoke-filled streets lined with smashed storefronts, the scene felt like an unnerving throwback to the 1979 Islamic Revolution in Tehran, Iran, where I lived with my U.S. Air Force officer husband, who was stationed there. The indelible memory of that city when my three children and I were evacuated from Iran was of neighborhoods and streets replete with fires, the sound of gunshots and marauding bands of so-called rebels. My encounters with Rodney King in the years since the L.A. riots and after moving to Wisconsin have been like that of most other people, via media reports, which included his problems with alcohol, drugs and domestic violence. As I followed the interviews he gave last year marking the 20th anniversary of the beating and, more recently, the officers’ acquittals, I hoped he was finally on better footing. He looked and sounded good, I thought. With his passing on June 17 at just 47 years old, though, I am hopeful that the significant – and, so far, lasting – L.A. Police Department reforms that that March 3rd, 1991, incident brought about will remain a permanent and positive legacy of Rodney King’s life. You might expect it to be déja vu. But about the only similarities between the demonstrations and protests that marked the Islamic Revolution of 1979 and those of today is the location. Tehran, Iran. The anger that exploded on the streets of Tehran 30 years ago was directed outwardly, specifically at the United States. I still have photographs of graffitied walls and shuttered shops of that era that screamed, "Domed Yankees Go Home!" and "Allah Ekbar." The gun-toting rebels that overran the neighborhood in which we lived back then were looking for Americans. By then, my three children and I had been evacuated from the country on an Air Force cargo plane, but my husband was still there. On the day the rebels stormed the house where we had lived, my husband was hiding with his .357 Magnum in a bathtub on the top floor. He wasn't discovered, however, because an Iranian engineer on the first floor of the house who knew my husband was upstairs told the marauding revolutionaries that he had gotten scared and run away. The current unrest is inward. Outrage over what ostensibly looks like a fraudulent election among Iranian candidates for an Iranian office. No apparent outside meddling from foreign powers. No unwanted occupying -- or advising -- military force. And despite criticism and prodding by some U.S. politicians and pundits, President Barack Obama has refrained from interjecting U.S. policy or politics into Iran's internal affairs. The conduct of the demonstrators is different. Screaming, chanting, waving and shooting guns, violence, extremism, religious fervor marked the revolution that ousted the Shah and his regime in 1979. Other than minor scuffles, a largely silent, peaceful five-mile long march with minimal violence at the end when government troops shot into a group that started a fire near the building that housed the militia. Rather than guns, the marchers carried signs. The makeup of the crowd is different. Thirty years ago, the people jamming the streets were almost entirely male. In contrast, a large percentage of the current post-election protesters are women. And they're not all uniformly clad in the black-only head-to-toe chador without even one offending hair in sight that became the required garb of the Islamic Republic of Iran. While still completely covered, today's Iranian women are clad in clothes of many colors, some decorated with designs, and head wear that doesn't always entirely hide their hair. Technology of today was the dark ages by comparison in 1979, and might prove pivotal to the outcome. Even the time of year is different. The '79 revolution raged in the bitter cold of winter. The demonstrations of today are in shirt-sleeve weather. What is the same, however, is the Iranian people. Just as 30 years ago when we knew many decent human beings - including the engineer at the house we lived in and who I firmly believed saved my husband's life with no expectation of reward and perhaps even at the risk of his own well-being -- the vast majority of Iranians today are decent people who want only the best for their country and their fellow Iranians. As the United States marks the 150th anniversary of noted Civil War battles, one form of commemoration – re-enactments – generally leave me with a feeling of discomfort. For a long time, I didn’t know why. Civil War re-enactment is a popular avocation for many present-day Americans. I have a friend who is avid re-enactor. I recognize the sense of history and “getting back to the earth and the basics” re-enactment encampments impart, and the feeling of purpose and satisfaction combat play-actors enjoy. But it wasn’t until I heard historian Thomas Martin Sobottke on WUWM’s “Lake Effect” describing Wisconsin’s 2nd, 6th and 7th regiments’ role in the Battle of Gettysburg that I began to understand what bothers me about these events. It is the underplaying, and even non-playing, of the horrific lessons that brutal war should have taught us. What is touted are the glories of the war, the acts of courage, the tales of regiments with more than half of their numbers fallen regrouping to charge and charge again. Yes, that kind of heroism did help the North win the war, but what needs to be highlighted is the terrible toll that war took, not just physically, but psychologically. Participants, spectators and chroniclers of Civil War re-enactments need to convey the stench of fields strewn with bloated bodies, the image of blown off limbs, the revulsion of gangrenous stumps and wounds, the chest-constricting grief the wives and mothers and children suffered over the loss of their men and the hardship of injured combatants living with forever-broken bodies. More devastating in the long term than the physical and economic ruin left in the wake of that war, though, is the psychological damage. “South shall rise again,” was the rallying cry of the defeated Rebels. Growing up near Richmond, Virginia, I was infused with constant reminders that my birth city was the capital of the Confederacy. Instead of feeling any sense of shame, though, or that the South was wrong to try to tear the country apart, I was imbued with a pervasive Southern pride that, although defeated in battle, we actually prevailed because we were right. The Yankees might have declared themselves victors, but we weren’t vanquished. We remained strong, resilient – and relevant. Our acts of defiance included flying our flag, erecting statues of our generals and demonizing theirs. That was part of what it meant to be a Southerner. But the older I got, the more juvenile that thinking seemed and was something, I believed, the South needed to and eventually would get over. Texas Gov. Rick Perry hinted a few years ago that Texans might get so fed up with the federal government that they might want to secede from the union. Talk like that makes my blood boil! I want to drag anyone who speaks so glibly to the cyclorama at the Gettysburg Museum and Visitors Center, which depicts Gen. Pickett’s Charge up Cemetery Hill during that three-day bloody battle that resulted in more than 50,000 casualties. Casualties? What a euphemism! Those were people. Human beings. Nearly 8,000 men died in battle and many more from wounds and resulting disease. Those were American lives lost. Is that what secession-mongers want for their loved ones and neighbors? But the greater lesson for me goes way back before the first shot in the Civil War was fired. It began with Southern landowners, good Christian family men and their “plantation wives” who attended church and quoted from their Bibles, all the while holding other human beings captive, ripping husbands from wives and mothers from babies, and forcing them into hard labor – even though those people were guilty of nothing more than living their own lives a continent away, but were unfortunate enough to be seized by mercenaries and profiteers, shackled in ships and sold at auctions like so much cattle. The corrosive cognitive dissonance that enabled Americans to justify the most horrendously immoral means to achieve economic gain has metastasized into this country’s most polarized population since that violent, hate-filled, nation-rupturing attempt by one region to prevail at all costs. Resentment of the federal government not only continues to flourish in the South, it has spread beyond the borders of the old Confederacy. It is a resentment that is as incongruous as professing Christians owning other humans and forcing them to do their work. Despite its talk of secession, Texas, like most of its Southern sister states, is a major federal funding recipient, and immediately asks the federal government for disaster aid when hit with catastrophes such as the explosion earlier this year in the town of West, and monster tornadoes and landscape-scorching wildfires. A man who lives in my Milwaukee-area neighborhood flies a “Don’t Tread On Me” flag outside his house. Yet, like separatist-minded Texans who revel in clawing the hand that feeds them, this man and his wife are on Social Security and Medicare and for years their adult son received government disability assistance. So here we are 150 years after Gettysburg in what seems like anything but a “United” States of America, where some people claim to be “more American” than others, where some say they are “the real Americans” as if others aren’t, where some wrap themselves in and fly the flag from everything they own as if to prove they are more patriotic than those who don’t, where some want the law to reflect their religiosity to the exclusion of other Americans’ beliefs, and where those with white European ancestry perpetuate their sense of American supremacy by qualifying and separating Americans of other ethnicity with hyphens. Unless Civil War re-enactments and other commemorations start emphasizing the relevant lessons of that conflict, including its origins and realistic consequences, today’s bullheaded, hate-filled, self-righteous polarization could lead the country down the same kind of destructive path that Civil War combatants took. To thrive as a nation, I think that instead of hyping differences and divisions, Americans need to lose the hyphens and get “united” back into the states of America. The recent spate of frigid weather took me back to a blisteringly cold day last winter when I was leaving an office in a high rise downtown. I was struck by his face. Angelic, is what came to mind. Round, sweet, boyish, not yet hardened by life’s vagaries and injustices. His eyes were glistening and he flashed an expectant half smile. He turned and walked away, a knit cap pulled low over his ears and bundled in so many layers he waddled. I was shocked as I hurried toward the parking structure. I kept on going, my legs working like sticks of wood. “He was even specific about what he wanted it for,” an inner voice chided. I had the money. Maybe not the exact change he asked for, but a few dollar bills and I could have easily given him one. I still could. I could run back and do it. But, no, that would expose my fib. But isn’t that the ploy? another voice chimed in. Seventy-five cents from you, 50 cents from somebody else. It adds up. Some panhandlers do pretty well. And it’s a lot easier than getting a real job. What? the first voice shot back. You think he’d rather be out here in this god-awful cold than filling orders in a burger joint, or that it’s easier to beg money from strangers than to pick up trash dropped by shoppers? Did he really look like he was doing pretty well? Pushing through the parking structure door, I thought about the great scold I am about people in this country not wanting to take care of others, about those who disparage social-safety nets and say we shouldn't be a nanny state. Was being a hypocrite any better? With my car in sight, I remembered a plastic bag of quarters in the glove compartment for parking meters and road tolls. No matter what, I decided, that man could use seventy-five cents a lot more than I would miss it. With that bag of quarters, I could save face and help him with bus fare at the same time. But would I be able to find him? I decided to try. Bag in hand I hustled back into the building and scanned the long corridor stretching a city block ahead. No sign of a dark waddling figure. I pressed on, knowing that the end the corridor intersected with another one on the left. I reached it and turned left, wondering how far I was willing to go before I would give up, when I spotted him a couple hundred yards ahead. “I’d like you to have this,” I said and handed him the bag. He looked even more surprised. I couldn’t think of anything else to say, so I turned and left, feeling good. Mission accomplished. With grizzled chin and gaunt cheeks creased. With hunger shaking at his hand. Man, how glad I am no one required I take a stand. Oh, I could have handed him some bread. No, I wash my hands of that bad blood. I think by dawn his form should fade. Many dawns have passed since that day last winter, but that young man’s form has yet to fade. Lake Effect essayist Jerrianne Hayslett is a writer and former journalist and court information officer. 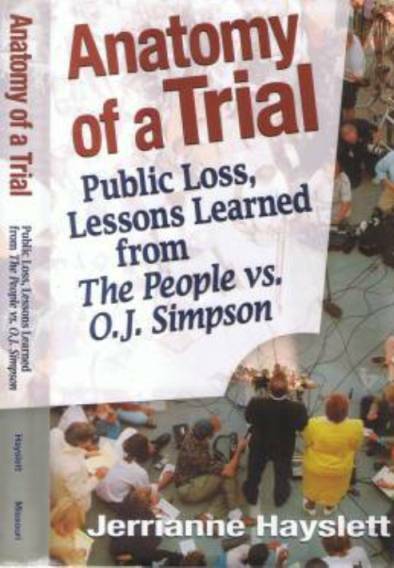 She lives in South Milwaukee and is the author of the book Anatomy of a Trial: Public Loss, Lessons Learned from The People vs. O.J. Simpson.